Our curriculum is based on the belief that children develop physically, mentally and emotionally by actively participating through play. As the nation’s largest provider of child care programs, YMCA’s provide family-centered, values-based programs to nurture children’s healthy development. Well-trained staff provides safe, affordable, high-quality care so you can have peace of mind while you work. Like all Y programs, child care is open to all, with financial aid available including state assistance through the Children, Youth, and Families Department (CYFD). Staff members are partners with parents and other caregivers, working together to help children grow up healthy, happy and strong. 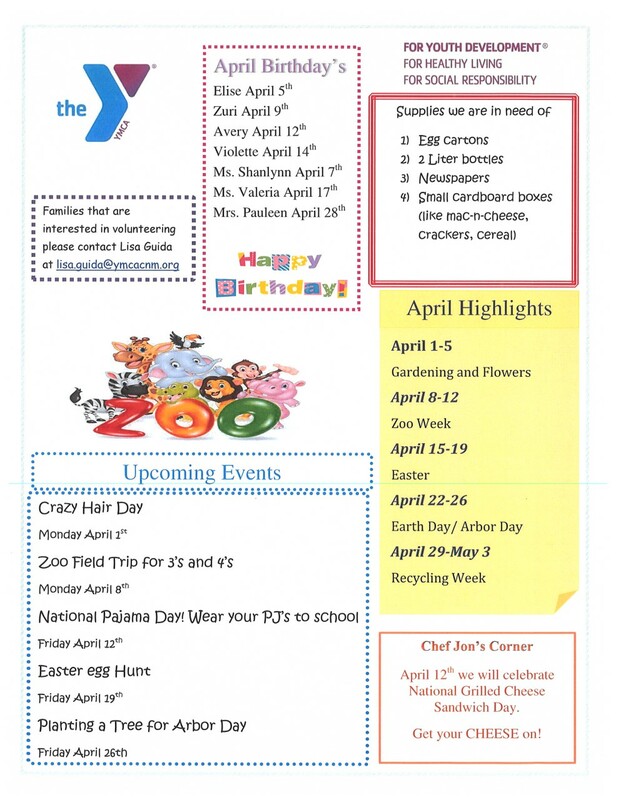 In addition, free lunches will be provided to all children attending at the Horn and Central Family YMCA locations. At YMCA of Central New Mexico, we are dedicated to providing high-quality, affordable early learning and child care that nurtures children’s healthy social, physical, and mental development. Self, Family & Community- Self-awareness, self-control, personal responsibility, cooperation, relationships with others, knowledge of neighborhood and community. Literacy- Listening and understanding, speaking and communicating, emergent reading and writing skills. Aesthetic Creativity- appreciation for the arts. Numeracy- Number and quantities, geometrical and spatial concepts, measurement and comparison, the ability to investigate, organize and create representations. Scientific & Conceptual Understanding- Use of the scientific method to investigate, acquisition of scientific knowledge related to earth and life science. Physical Development, Health and Well Being- Gross motor, fine motor, health and hygiene, and safe behaviors. Approaches to Learning- curiosity, initiative, imagination, and creativity, confidence, persistence, problem-solving. 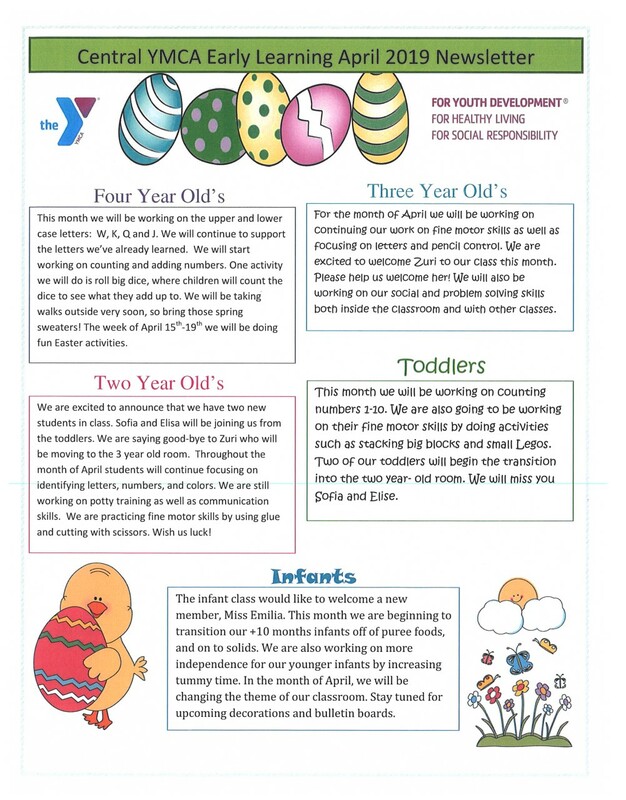 Offered only at Central Family YMCA: Welcome to Spring!